It’s National Peach Month! 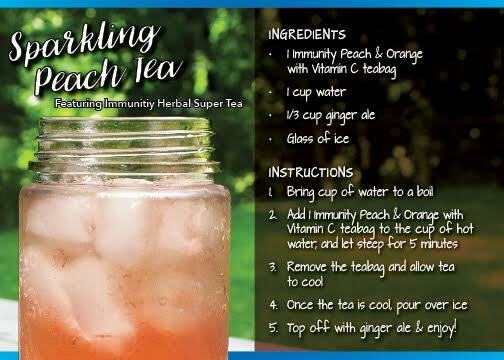 This BIY (brew-it-yourself) iced tea recipe from Tetley Tea bubbles up ginger, peach and orange to a perfect fizzy punch that is both refreshing and refreshingly easy to make. We used Hansen’s Diet Ginger Ale to cut calories & sugar, but keep the delightful taste! 1. Bring cup of water to a boil. 2. Pour over 1 Tetley Immunity Peach & Orange Super Tea teabag in cup, and let steep for 5 minutes. 3. Remove the teabag and allow tea to cool. 4. Once the tea is cool, pour over ice. 5. Top off with ginger ale and enjoy! Watch how it is made here! Late Summer Eco-Finds for Little Ones! While our youngest daughter headed off to kindergarten this week, it is still over 90 degrees F here in Florida, and we have months left of pool & beach time! My sweet little guy and I are enjoying our special time together, and these are just a few of our favorites for fun in the sun….year-round! We all scream for ice cream! 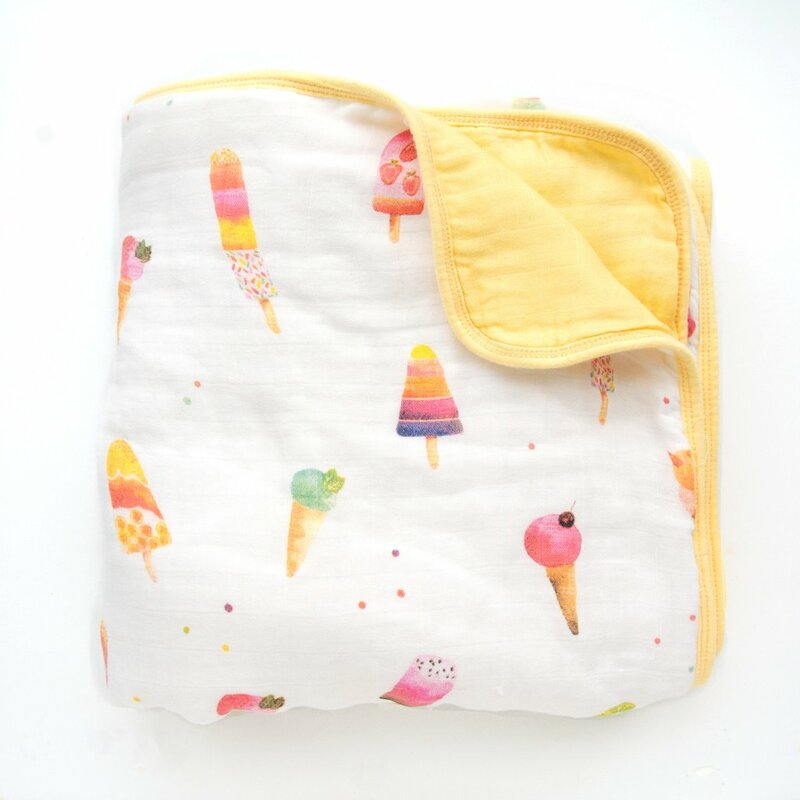 This extremely soft, luxe ice cream printed quilt blanket is a huge hit in our home…with both the 1 year old and the 5 year old! With a pastel sunny yellow trim and back, this blanket is bright, sunny and a must-have for little ones! Loulou Lollipop’s luxurious quilt is made of 4-layers of super soft rayon created from bamboo, which makes it gentle and soft on delicate skin. As if the blanket isn’t already soft enough, it gets softer with each wash! It is breathable, sustainable, durable, and machine washable. With quality being a top priority, Loulou Lollipop makes all of their adorable goods by hand. 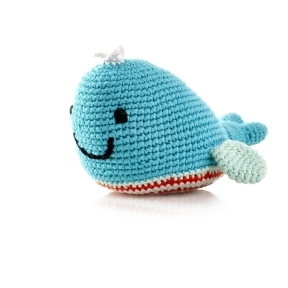 Make waves with this adorable fairtrade toy! Everything whale be alright when your little one has this soft rattle while playing on land or in the sand as we soak up the last of the summer sunshine! The soft toy can be submerged in water and is machine washable… and retains its’ shape after play or wash! Irresistibly cute, Pebble is the best in hand manufactured soft toys from community businesses in Bangladesh. We love that this business is helping women out of poverty and putting smiles on faces worldwide! All Pebble products are made by Hathay Bunano. Hathay Bunano, meaning hand made or hand knitted in Bangla, is a non-profit fair trade organisation in Bangladesh. Its mission is to create fairly paid, good quality, flexible and local employment for rural women who are poor and often disadvantaged. Here in Florida, sunshine and mosquitoes are year-round! It is a necessity to protect our children’s skin from harmful rays and irritating bugs the natural way! Babytime’s Sunny Sunscreen and Mighty Shield Bug Lotion will keep your child’s skin safe from nature’s elements without adding harmful chemicals. We love that the Mighty Shield Bug Lotion applies evenly and easily like lotion rather than a spray, which is much more effective! With broad spectrum SPF 35, the sunscreen isn’t greasy and is water resistant to 80 minutes. Plus it is enriched with green tea and aloe! 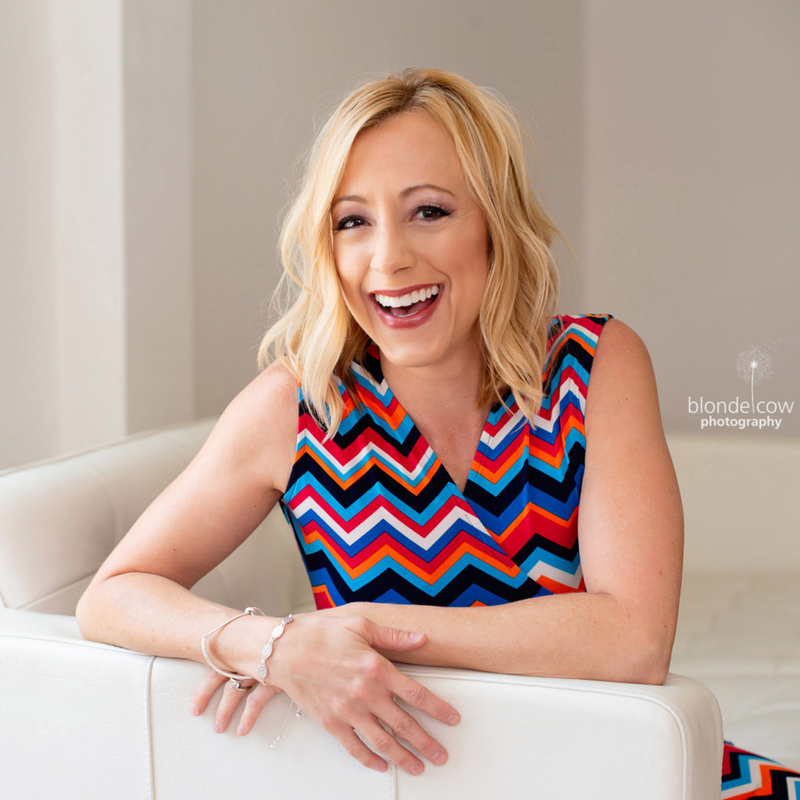 http://tinygreenmom.com/wp-content/uploads/2017/08/Blue-Pebble-Whale.jpg 288 288 Tiny Green Mom http://tinygreenmom.com/wp-content/uploads/2018/07/logo-sm.png Tiny Green Mom2017-08-19 05:04:202017-08-19 05:04:20Late Summer Eco-Finds for Little Ones! It’s no secret that we love mangoes in our household! 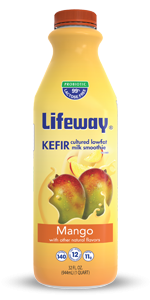 Spice up your Friday morning with Lifeway’s turmeric mango smoothie! 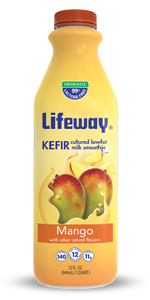 A blend of superfood spices, ginger, and tangy mango kefir will keep you glowing through the weekend and beyond! It’s late summer, and you’re feeling like changing things up a bit! Songa Designs’ handbags help you make that bold statement! They’re socially conscious, roomy, eco-friendly and anything but boring! Handcrafted by skilled artisan women in Rwanda, Songa’s handbags are individually unique and make a fashion statement with a meaningful purpose. 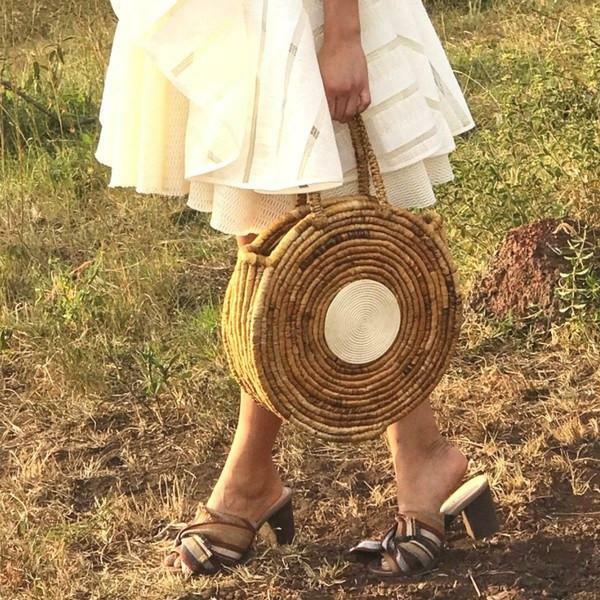 We love that Songa Designs combines eco-friendly materials, international reach, and on-trend statement pieces to show how your personal style can have a profound impact across the globe. Songa Designs provides employment for more than 175 women artisans, giving underprivileged women the opportunity to earn their own money to buy land, healthcare or send their children to school for the first time. 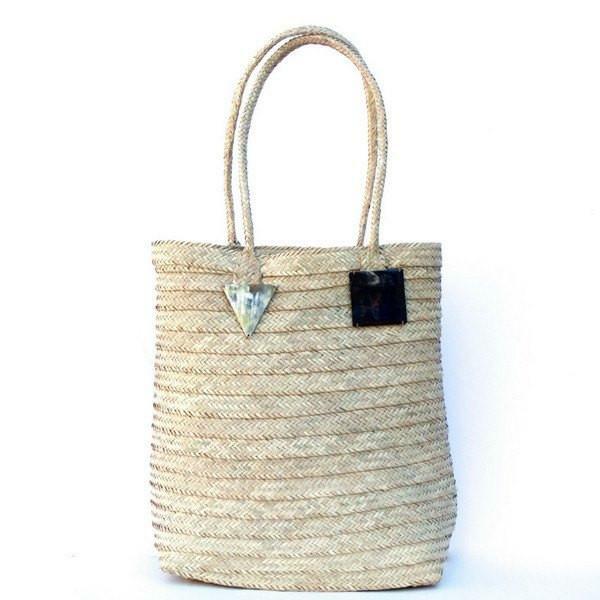 Songa’s statement bags like the geometric Orenda Handbag above or the minimalist Nia Tote below are made using all-natural materials such as banana leaf fiber, sisal plant, pewter, re-purposed cow horn and upcycled fabric saved from landfills. With boho-chic designs and trendy shapes, Songa Designs’ accessories are a gorgeous accessory to any outfit! 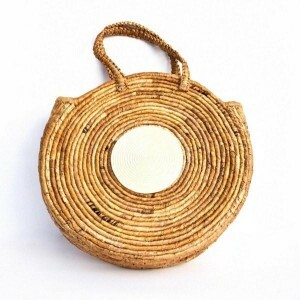 Songa Designs International empowers a new generation women around the world with Urban Tribal accessories. It is typical for many women in developing countries to depend solely on their husbands for financial needs, but Songa Designs is changing this dynamic. By working for Songa, under-resourced women are encouraged to pursue economic independence, simply by using skills acquired through everyday life. Songa Designs provides jobs for over 175 women who in turn negotiate their own salaries and earn fair wages, which enables them to buy land, health insurance or send their children to school for the first time. Trained by generations of local cultural tradition, the skilled artisans of Songa Designs in Rwanda in East Africa craft stylish, high-quality accessories inspired by nature. Each handmade item is tightly woven with all-natural materials such as banana leaf fiber, sisal plant, pewter, re-purposed cow horn and upcycled fabric that otherwise would end up in landfills. Defined as “the path forward” in Swahili, Songa Designs is synonymous with the journey toward economic empowerment for women in developing countries.